When your car, light and heavy duty truck or SUV is properly tuned, the ignition system, the emission system and the computer system are all working together. This results in peak combustion chamber efficiency, saving you money at the gas pump; and making sure your vehicle is performing its best while emitting a minimum of pollutants. And even if you’re driving a late-model vehicle, it is a misconception that it doesn’t need routine maintenance to ensure it is performing its best. All cars, light and heavy trucks, RV’s and SUVs, weather they are an older model or newer require periodic maintenance in order to avoid performance problems such as hard starting, misfiring, surging, hesitation, and stalling. A service often overlooked designed to help your vehicle’s engine run properly is the cleaning of fuel injectors and the fuel intake system. When dirt and deposits collect on fuel injectors, the amount of fuel delivered to the engine is restricted, leading to deterioration in performance and responsiveness. At Park Muffler, Edmonton area automotive tune up center, our trained technicians can perform a Fuel System Cleaning that will remove these deposits and help your vehicle maximize its performance and gas mileage capabilities. Regular maintenance of your vehicle’s fuel ignition system is the key to reliability, fuel efficiency, and effective engine performance. From fixing a fuel system problem when it occurs to helping you prevent one from happening in the future, the technicians at Park Muffler are there to keep your engine “tuned-up” and ready to go. 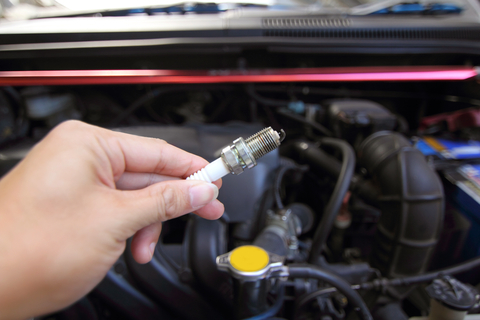 Our tune-ups include new spark plugs and points, if equipped. We also check the condenser, rotor and distributor cap if equipped. All tune-ups include labour to install parts and any necessary adjustments. Drivability diagnostics (if necessary) may be extra. (Internal or sealed carburetor adjustments not included). Come in today to our automotive tune up center or call us to schedule an appointment with one of our trained technicians.